Veteran Gordon Marshall is to leave Motherwell and join Hibernian as their goalkeeping coach. The 41-year-old is replacing former Dunfermline goalkeeper Ian Westwater, who has been forced to quit the Easter Road club due to injury. Marshall told BBC Sport: "There's a possibility I could re-register as a player in January in an emergency. "But my main role is goalkeeping coach and it's a great chance to take that next step with a big club." Marshall has played almost 700 professional games during a career that started with Rangers in 1982. He also played for East Fife, Falkirk, Celtic, who paid the Bairns £2.7m in 1991, and Kilmarnock. But he has made just one appearance for Motherwell this season. "Graeme Smith has come in while I was injured and done really well," said Marshall. "The way he has been playing, he should stay there for some time and the manager asked me if I would be interested in becoming coach at Hibs. "Ian Westwater is unfortunately having to give up because of a knee injury. "I played with Tony Mowbray at Celtic and I admire him as a coach and it is a great opportunity to work with him at Hibs." Mowbray believes the arrival of Marshall will be a huge benefit for his first-team goalkeepers, Zbigniew Malkowski and Simon Brown. "After such a long and distinguished playing career, Gordon sees the movement into goalkeeper coaching as the next step in his career progression," he said. 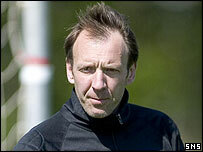 "He is determined to make an impact as a coach and is very enthusiastic about the role at Hibernian. "I am sure the tremendous amount of goalkeeping experience he has gained over the years will prove invaluable to the development of our current players."